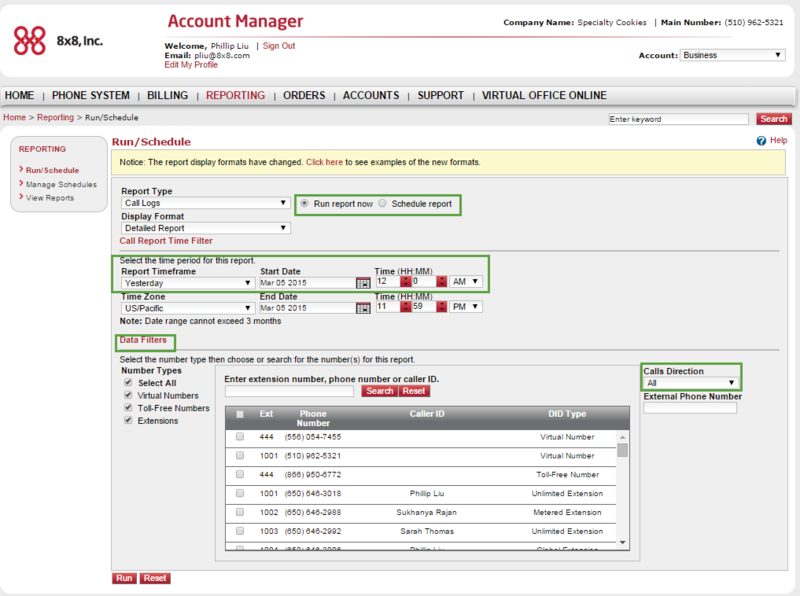 Using Account Manager, you can run and schedule call log reports that reflect activity on individual extensions, selected extensions, or all extensions. Click Reporting in the top navigation bar. Set the Report Type and Display Format to select the type and organization of the activity reflected in the report. Set the Report Timeframe. Data can be reported from the previous day, week, month, and more. You can also set a custom timeframe. Note: The date range cannot exceed 3 months. If necessary, set the Time Zone. Select the extensions you want to include in the report. 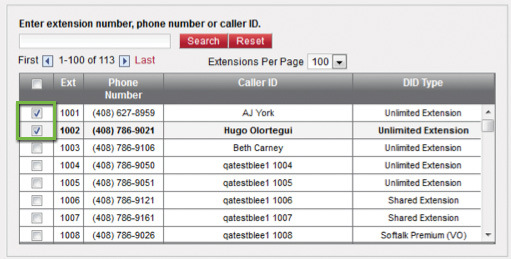 To track calls made to or from your contact center that involve a specific external number, enter an optional External Phone Number to include in the report. 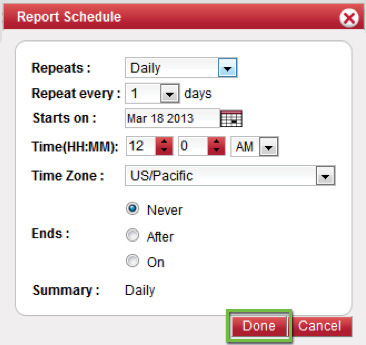 If you want to schedule a report instead of running one immediately, select Schedule Report. In the Report Schedule box that pops up, enter the necessary information. Reports can run at a future date, or on a daily, weekly, or monthly repeating schedule. Click Done when finished. Under Email Download Notifications To, select the system administrator you would like to send an email notification to once the report is ready. Note: Email notifications can only be sent to system administrators. To create new administrators for the reporting, go to Accounts > Privileges. Make sure to grant Reporting privileges. To make the report available to all your phone system administrators with Reporting capabilities, select the Viewable by all admins check box. If you selected Run Report Now, click Run to finish. Save to save a report without running it. Save and Run Now to save a report and run it. To edit scheduled reports, click Manage Schedules under the Reporting menu. To view previously-generated reports, click View Reports under the Reporting menu.